Martha Mooke isn't one for constraints. This pioneering musician's groundbreaking work on the five-string viola has won fans worldwide and given her many memorable experiences - including collaborating with legendary rocker David Bowie. A collaboration with Bowie seemed to be the perfect match because he is known for pushing the musical envelope. The two were brought together during a concert Mooke produced for other artists like herself, who weren't afraid to take the road less traveled. "I had produced a new music showcase called 'Thru the Walls,' that featured ASCAP composers and performers who do music that defies categorization," says Mooke. "I generally don't write for symphony orchestras, and I realized that people like me were falling through the cracks. I brought this to the attention of the people at ASCAP, and they put all of their efforts behind me to create this showcase." Mooke aspired to present classical musicians as well as rock-and-roll and studio musicians. To broaden her outreach, she asked friend and music producer Tony Visconti to introduce the showcase. Visconti-Bowie's longtime producer- mentioned that Bowie might be interested in attending the per-formance. "Sure enough, a few minutes before show time, Tony walked in with David Bowie and I was floored," laughs Mooke. "Thru the Walls" was a tremendous success, and continues to be one every year. Bowie joined Mooke's fanbase, and invited her to play with him at the annual 2000 Tibet House Benefit Concert. She put together a quartet to accompany Bowie on Visconti's arrangements of "Heroes" and "Silly Boy Blue" at the concert. Bowie was thrilled with the quartet's rendition. "It went over really well and he loved it," she says. "Then I got the call to do some work on the new album." In September 2001, Mooke and the quartet, which Bowie dubbed the Scorchio Quartet, traveled to a recording studio in Upstate New York. They spent part of the fall working on the original works on "Heathen." He was so impressed with the quartet that he again asked them to accompany him for the 2002 Tibet House Benefit Concert. "We did one of the new songs on the CD, and then Tony did an amazing arrangement of 'Space Oddity' which he scored for double string quartet," she says. "It blew everybody away." Because they worked so well together, the quartet decided to put together their own repertoire. "It's a whole different concept for string quartet that's really solidly electroacoustic," says Mooke. "We all play classical and acoustic instruments, but we also do electric playing and we've all played jazz, rock, and other assorted styles. We're premiering pieces and reworking some old pieces. Several of us are composers, so we're writing for the group as well. We have a lot of plans." In performance, a traditional-sounding passage will give way to mesmerizing mood sequences and then, it seems, half an electric orchestra is playing-but it's all her." Mooke remains busy outside of the quartet. She's now in the process of putting together a tour for her duo, Bowing. She and guitarist Randolph Hudson III released their first CD titled "Café Mars," which is described as a dynamic and futuristic musical experience-but Mooke can better elaborate on the duo's unique music-making process. "We use the E-Bow which is a device that's held, instead of a pick, over the strings of an electric guitar," she explains. "You get a bowing sound, like a violin bow. We do a lot of work with digital effects processing and loops, so there are actual times when you don't know who's playing. I'll sound like a guitar and he'll sound like an electric viola." Despite all of her performances, Mooke still finds time to devote to her work as a Yamaha clinician. She's been instrumental to the evolution of the EV series and has seen firsthand how well the electric string series is received by students. "I'm mainly a violist, but I've been playing the Silent Violin™ while they continue to develop the Silent Viola™. From the very beginning I've encouraged Yamaha to continue making innovations with the series." She traveled to Japan in 2000 to see the prototypes and to lend insight from her years of work as a clinician and performer. "My specialty is the five-string," she explains, "and when I got over there I was surprised. Not only did they have the Silent Viola, but they also had a second generation Silent Violin and both the four- and five-string models of the new electric violin." Mooke is never far from her Yamaha electric violins. She says their modern design and practicality are tremendous pluses. "The schools love them," she says. "When I go in and start playing the bright red violin, that's the first thing the kids latch onto. And then I can plug it in and make it sound like so many different things. Kids love the flexibility of it. They never thought a violin could do those things." Highly regarded for her work with the five-string electric viola, Martha Mooke spends a lot of her time traveling the world, as she did here on "Live from Downtown" on Downtown Commumity Television Center )DCTV) with host Tasha Guevara in New York City, New York. 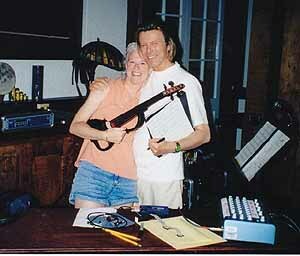 Mooke spent September 2001 in the recording studio with David Bowie working on original works for his recent release "Heathen." 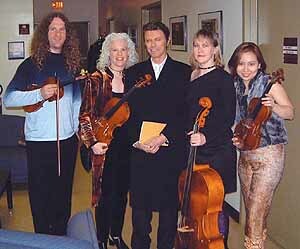 Bowie is surrounded by the members of the Scorchio Quartet after the 2002 Tibet House Benefit Concert. Pictured are Gregor Kitzis, Martha Mooke, David Bowie, Mary Wooten, and Meg Okura. 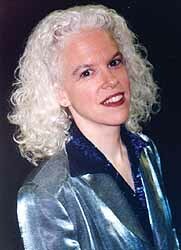 As a clinician she has introduced many students to a world without barriers and full of music. Mooke continues to constantly upgrade, change, and shape the musical world she has had a hand in discovering.